I first encountered Clare Balding as a sports commentator on BBC for the 2012 London Olympics (this interview is particularly famous). For whatever reason, I found myself connecting with her as a trusted voice and when she popped up on other programs on British television, I often found myself tuning in. She primary covers racing, which is not a sport I follow regularly, but she also presented the 2014 Sochi games and comments on Wimbledon. My husband – who is Irish – told me she came from a very famous racing family and had connections to the Queen. Beyond that, I knew little. In early 2013, we were watching Channel 4 when we saw an advert for a documentary she was hosting called “Secrets of a Suffragette” and that it would include a special focus on the incident at Epsom Downs in 1913 when Emily Davison threw herself in front of the King’s horse to draw attention to the women’s rights movement in Great Britain. I set the DVR immediately and the husband and I watched with rapt interest when the documentary finally aired. We were not only taken with the material presented – which he was particularly appalled he was never taught about it in school – but with how affected Balding was by Davison’s act. She was able to provide insights into the horse racing culture I think the documentary would have suffered without and I was really glad she was our guide through that story. At that point, I began to seek out things produced by Balding, books and documentaries specifically. So when I finally had some time recently and I saw her early-life memoir My Animals and Other Family was available in my library, I was thrilled. The book was a delightful and easy read – with one large exception. Balding clearly assumes her readers are familiar with English geography or at least the basis of English horse racing culture. There are a lot of terms and locations simply thrown about which kept sending me to Google. I’ve lived in the U.K. for 5 years and I know a bit just from watching the weather reports on BBC, but I would imagine that anyone reading this who didn’t have a basic grasp would be lost. I did find myself skipping quite a lot of the descriptions of her racing – the mechanics of racing was not nearly as interesting as the insights into her life. Her growing up years, surrounded by animals and punctuated by visits from Queen Elizabeth (Balding’s father was a trainer for some of the Queen’s horses), were so very different from mine and I loved those bits. Considering that I came to her largely due to a documentary about feminism, I was shocked to hear that she grew up in a family who was largely opposed to gender equality. Her grandmother, especially, was both a trailblazer for women in the racing industry and a woman who was entirely opposed to women in political leadership or having independent income. If I ever had the chance to talk to Balding in person, it’s this part of her life I think I would want to ask her about. The book is peppered with traditional dry British humor and one-liner asides. I’d recommend enjoying it with a lovely cup of tea, Earl Grey with lemon was my personal preference. Anyone who enjoys gentle memoirs about lives different than theirs and has a particular affection for animals should pick this up, with the caveat that the locations may be slightly confusing for some. Horseracing in fiction: This article from the Guardian describes some of the best works of fiction which incorporate the culture of British horse racing. I received this book from the eBook section of my local library. 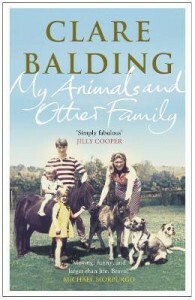 Animals, Books with Children, England, Memoir, Non-Fiction, Tea, U.K.